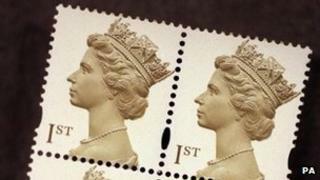 A second-class stamp will go up from 36p to 50p - some 5p below the top price allowed by Ofcom. It claimed the future of the universal service was at "severe risk" without relaxing controls. Royal Mail said that the cost of posting Christmas cards in 2012 will be the same as last year for consumers on Pension Credit and Employment and Support Allowance or Incapacity Benefit. They will be able to buy up to three books of 12 stamps - 36 stamps in total - in one purchase from any Post Office branch from 6 November until the last posting dates before Christmas. Individuals must provide evidence that they are in receipt of these benefits. Media captionDo members of the public know how much a first-class stamp costs? Ofcom said that changes needed to be made to price limits, because the future of the UK's universal, six-day-a-week postal service was "at severe risk" as people switched to using text messages, e-mails, and online messaging. After consultation, it has now confirmed plans to lift some of the price controls - a move recently backed by a committee of MPs. The Commons Business Committee did raise concerns about vulnerable customers, and Ofcom said the cap on the cost of second-class mail was designed to protect this group of people. Shortly after the announcement from Ofcom, Royal Mail announced exactly how much it will charge for stamps from 30 April. Royal Mail's chief executive, Moya Greene, told the BBC that the one-price-whatever-the distance universal service was under threat because the organisation's financial situation had been "very fragile" for some time. "In the core business in the past four years we have lost over a billion pounds," she said. "No one likes to ask their customers to pay more, I certainly wouldn't do it, especially in these economic times, if it were not absolutely essential." But she said there was "not an affordability issue" as stamps cost less than a chocolate bar. Ofcom said that the average household spent around 50p per week on post, with low-income families typically spending less. "Ofcom's decisions are designed to safeguard the UK's postal service, ensuring it is sustainable, affordable and high-quality, to the end of the decade and beyond," said Stuart McIntosh, of Ofcom. "The measures ensure that Royal Mail's products remain affordable for vulnerable consumers and small businesses." Royal Mail delivered 16 billion letters to around 28 million addresses last year. However, since 2006, there has been a 25% decline in postal volumes with further falls expected. Ofcom, which took over regulation of the industry from Postcomm, said that Royal Mail might not be able to keep up with current standards without regulatory changes. The regulator demands that Royal Mail targets a record of delivering 93% of first-class mail by the next day and 98.5% of second-class mail must arrive within three days of posting. Royal Mail's letters business made a loss of £120m in 2010-11. A Department for Business spokesman said: "Price rises are never welcome. However, ministers are clear that the top priority is to protect the universal service on which people rely. "But this service comes at a cost, and its provider, Royal Mail, needs to be financially viable. The most important thing is to secure the universal service, but price rises are only one part of the story, the successful modernisation of Royal Mail is also crucial." Up to 90% of Royal Mail can be sold, following an Act of Parliament last year. This was most likely take place in the first quarter of 2014, probably through a sale of shares, according to chief executive Ms Greene. Media captionMoya Greene, chief executive of Royal Mail: "It's a service that is very cherished... but it's also a service that has to be paid for"
Sharon Little, chief executive of the Greeting Card Association, said more cards were sent per person in the UK than anywhere else in the world, but the change in prices was a "worry". She said that the association understood the pressures on Royal Mail, but she called for the group to extend its price freeze this winter to all pensioners, not just those on certain benefits. The majority of people, she said, sent their Christmas cards by second-class post, but birthday and mother's day cards tended to be send first-class. Small businesses that made cards tended to sell upmarket products, so she hoped the increasing price of stamps should not affect these businesses too much. Billy Hayes, general secretary of the Communication Workers Union, said: "Those people who baulk at the idea of stamp price rises should understand that it comes directly from government decisions to privatise this industry." John Walker, national chairman of the Federation of Small Businesses, said: "With 84% of small firms dependent on Royal Mail, it is welcome news that they will receive discounts on some products. "However, it does not go far enough. Rapidly raising stamp prices now will be bad for business. With small businesses and consumers being hit by other rising costs, this has come in at a time when they can ill-afford it."